The president's reluctance to participate in the national remembrance for the Arizona senator was awkward and uncomfortable. WASHINGTON – Glowering in public and near-silent for two days, President Trump relented under pressure on Monday by tersely recognizing Sen. John McCain’s “service to our country” and re-lowering the White House flag. While much of the nation remembered McCain’s record as a war hero, longtime senator and presidential nominee over the weekend, Trump had nursed his grievances. McCain had been an infuriating foil in a long-running feud over style and policy that did not end with the senator’s illness and death. Trump’s reluctance to participate in the national remembrance was awkward and uncomfortable, even by the standards of a leader who acknowledges he doesn’t act like a typical president. The episode highlighted the outsider president’s impulse to harbor personal resentments regardless of political repercussions. Before Trump’s Monday afternoon statement, his only commentary on McCain’s death had been a perfunctory tweet on Saturday. The lack of a formal statement – combined with the fact that White House flags were flown at half-staff only briefly – drew strong criticism from Republicans and veterans’ groups as well as Democrats. Earlier in the day, a stone-faced Trump sat mute as reporters at several photo sessions invited him to comment on McCain. As he was peppered with questions about McCain’s legacy, the usually talkative president made no response. 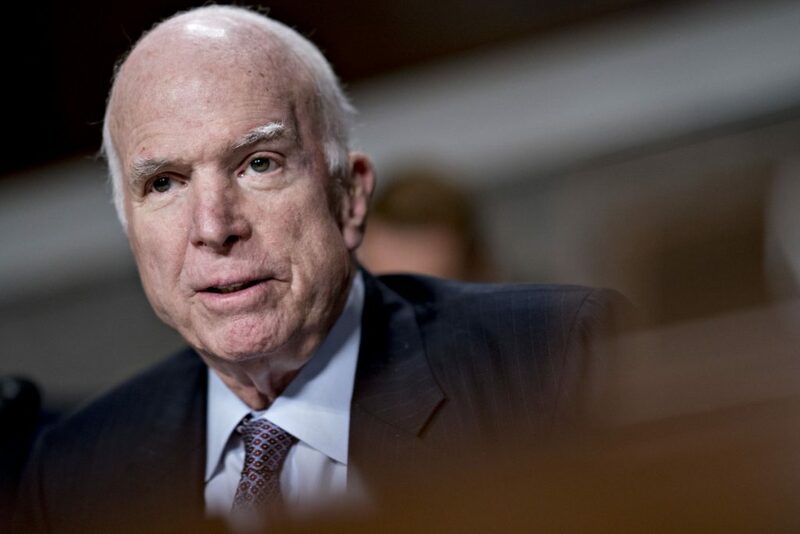 “On the behalf of The American Legion’s two million wartime veterans, I strongly urge you to make an appropriate presidential proclamation noting Senator McCain’s death and legacy of service to our nation, and that our nation’s flag be half-staffed through his internment,” said a statement directed to him from Denise Rohan, the organization’s national commander. While the president’s statement sought to defuse the controversy, the upcoming weeklong celebration of McCain’s life is likely to bring new awkwardness. Former presidents will speak at McCain’s funeral on Saturday, but the senator’s family made clear they did not want Trump to attend. Trump said he had asked Vice President Mike Pence to speak at a ceremony honoring McCain at the Capitol on Friday and that other administration officials would attend memorial services. He also said he’d agreed to the McCain family’s request for military transportation of the senator’s remains from Arizona to Washington. Burial will be Sunday at the Naval Academy in Annapolis, Maryland. After Trump took office, McCain established himself as a leading critic, opposing Trump’s immigration-limiting order, warning him against coziness with Moscow and lecturing him on the illegality of torture.